At 13 years old, Maya Kitajima seems destined to spend the rest of her life toiling in a crowded restaurant alongside her bitter and unstable mother. But when her incredible acting talent is discovered by the legendary diva Chigusa Tsukikage, Maya finds a new future filled with both golden opportunities and terrifying risks. But for one to win, the other must fail! I know this is grave digging, but After having discovered the Glass Mask manga, and then this anime, I was suprised how superb they were. The newest version updates the style of the characters, but it still follows the manga fairley closely. THIS is the kind of shoujo I want to watch, much, much better than the typical shoujo we get these days. The characters are all engrossing and interesting, even all the supporting characters are well fleshed out and with an interesting and realistic story. If anyone hasn't seen this I strongly reccomend watching the manga, and then watching the anime. Glass Mask is not the best anime ever, but it holds beauty and content that are some of the best ever seen in anime. The series is a biography of a child actress. It captures the whole life of its main character from childhood to adulthood, from complete beginner to professional. The series is similar to the sports genre where stories completely and utterly rely on character development. The series selling point is the acting itself. The training for these plays as well as the plays itself are content that is simply not available anywhere else, and they are polished beyond belief. My favorite act was perhaps Helen Keller's childhood. The actresses went into the role of a young girl who was both blind and deaf since birth. Never been able to interract with other people or the world in any other way but by taste, smell and touch. The way our girls train to achieve this same state in character and deliver it in the play was simply said shocking. It was so natural and radical way of presenting the rawness of human nature that it left me shaking. Pretty much all of the major plays and events are similarly powerful, yet extremely different from each others. The series focuses on all sorts of plays, roles and working partners. Offering and leaving behind countless amount of memorable scenes and events that are surely to burn in to the viewer's very soul. The reason why Glass no Kamen isn't the best anime ever is very simple. It suffers from horrid romantic subplot. The beginning of the series is terribad. There is absolutely no point in even trying this series if you're not ready to give it at last 8 episodes. The same words can be said about the ending. The manga series it's based to has been published since 1976 and it's stlll ongoing. The anime has an original open ending and it's not pretty to watch. Despite all of these major problems and flaws, the uniqueness it has to offer: from one of a kind character development to the countless scenes that are animated masterpieces, this series is worth of a watch to anyone who is ready to take it for what it is. Glass no Kamen is a shoujo manga written by Miuchi Suzue starting in the mid 70s and still going. The series has had two anime adaptations. The first was done by Eiken in 1984 the second was done by TMS Entertainment and ran from April of 2005 to March of 2006. We're going to be looking at the TMS Entertainment version because I was specifically asked to look at that one. The Gent in question provided a link and everything. Kitajima Maya has always been a normal girl. She works after school to help pay for her and her mother's room and board. She also happens to have a bad habit of getting distracted by dramas. While re-enacting a scene for some children she comes to the attention of Tsukikage Chigusa, a former actress who had to retire when an accident left her scarred. Tsukikage sees a vast potential for acting in Maya and becomes determined to help her develop those talents so that Maya can eventually take the coveted Crimson Goddess role. A role that hasn't been seen on stage since Tukikage's retirement. This gets the attention of Hayami Masumi, the young heir to the expansive Daito entertainment. Maya's skills also quickly draw the attention of the young genius actress, Himekawa Ayumi. A girl who desires the Crimson Goddess role. Let's begin by looking at the negatives of the series. The biggest one is the romance. Fortunately, it's a somewhat downplayed element since the main focus is on Maya's journey to be an actress and on her rivalry with Ayumi, but it still bears talking about. Glass no Kamen has a creepy obsession with young girls getting involved with creepily older men who possess quite a bit of power over them. To the point where Miuchi would fit in with Clamp. In all fairness, Maya does get a couple of disposable love interests who are her own age and peers of hers. I'll just call them Something and Whatever. You might wonder why I'm not taking ten seconds to look up their actual names and that's because her relationships with them are dull and largely pointless. First you have Something, a young actor who appears early on and has a crush on Maya only to disappear for most of the middle and reappear at the end to take a role in a play and basically just exist. Then we have Whatever. A bloke who appears for a few episodes in the middle and go on a date with Maya before being banished from the series. The only other real issue is the ending. Again, to be fair there are some good aspects to the ending but there's also a lot of stupidity in it and the whole thing feels pretty rushed. Like they only learned it was going to be the last episode after finishing the episode before it and they scrambled like mad to try and resolve things. Let's move to the positive aspects. Final episode aside, the pacing is really excellent. The series is really good at building up tension and giving resolutions that really work. The narrative flows really naturally and seeing Maya's ups and downs is really compelling. I also like that she experiences legitimate setbacks instead of ultimately overcoming every obstacle that comes up. It really makes the drama stronger when you aren't sure whether this is going to be a case where everything turns out all right or if it's going to be a situation that ends badly, forcing her to pick herself up. Most of the characters in this are well fleshed out, have realistic flaws and verisimilitude. The big differences are Something & Whatever, who both have a generic nice guy schtick and a girl who comes across as kind of cartoonishly evil in the way she tries to destroy Maya's career. I do really love the rivalry between Maya and Ayumi. It's all too common for series like this to have rival characters who are obscenely petty but Glass no Kamen plays up their mutual respect and even has Ayumi stand up for Maya, in one case in a really badass moment. It portrays their rivalry as being based more on envy than anything else but the two still manage to get along pretty well. Which isn't just refreshing, but leads to a more interesting dynamic. The artwork is really well done. The theatrical stage designs and costumes look like the types you'd actually get in a real theatre. The whole series is really well detailed and has an authentic feel to it. The animation is always nice and fluid and gets really interesting during the scenes where they're actually putting on some kind of production. In terms of acting, Kobayashi Sanae and Yajima Akiko are absolutely brilliant in this. Not only do they play our main heroines, Maya and Ayumi, but they have to convincingly portray the various roles that both girls get, or convincingly fail to give a good performance in some cases. They both rise to the challenge and are just spectacular. The other various actors all do well in their roles too. Even the people voicing the weaker characters manage to give passable performances. The music is pretty good as well. There's not much. There's a girl named Rei who attracts some fangirls but they're shown as thinking she's a guy and she doesn't get romantically involved with any of them. There are also some moments between Maya and Ayumi that give you pause to question whether they're using Greta's definition of “rival” but there aren't many. Actually, this is strangely lacking ho-yay given that it takes place in the world of theatre. Although I suppose it's just as well considering what passes for romance in the series. 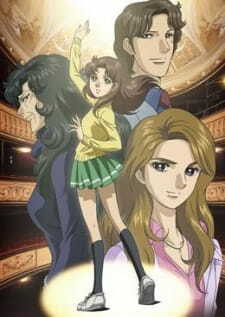 Glass no Kamen suffers a bit from the romance, the ending and from some generic characters. However, it is a really strong series overall replete with tension, drama, a lot of strong characters, excellent voice work and epic artwork. My final rating is a solid 8/10. Next week I'll look at Kigurumikku V3. If someone asked me what is the perfect acting anime what anime can be known as probably the best in its own genre then i would say Glass No Kamen. The story has the feeling of cliche around it since it almost depicts Cinderella who cant break out of her shell because she is held back by those around her. Having said that it wouldn't be the anime it was if it hadn't something like this in it and the way it flows is perfect with everything else that happens around it. Although there is drama in this anime even close to become a melodrama something makes you want look past in and look at it as general but great drama almost as if in a play. It never gets too suffocating which is normally the flaw in anime like this. It embraces drama in ways other anime to this date could learn from and know that this is how you make a story flow as it grabs the main character through her ordeals , this is how you make her feel sad and show it. Everything about this story has a meaning which is why it makes it even greater and one never get tired from it. As i watched this anime i almost binged it through all the 51 episodes because i always wanted to know what happened next even though that might bring another cliff hanger that one had to watch. It more ways than one the soundtrack captures what this anime is although it doesn't stand out too much its still good for the anime its in. The openings and endings are notbad but they are not the best either but again its not bad and it flows well for what it is. To start of most characters in this anime are great in their own regard and its even harder to pick out one or the other to give a better image of the anime but i will use the 3 mains in this anime to give a better image of how i viewed it. Kitajima, Maya a girl who grows up with a mother who expects nothing about her own daughter. She has a personality that one falls in love with at once. Her passion for acting feels so real you want to let her do well in whatever she does although her naiveness or dense personality has you wondering she is a perfect main character in many ways. You wont get tired of her but you will always want to see more of her. Himekawa, Ayumi who is what is called a genius in many fields of entertainment. I personally like how she is a mature yet fragile person in different ways. She isnt one of those cliche rivals to the other main whos only thing is to bully the others out of their role. No i love how she fights for her role no matther what it happens and aknowledge those around her for their abilities and doesnt try to put them down because of superiority. Hayami, Masumi a man with sometimes mysterious motives and a person you will either hate or love depending on how you see the story. His character is a divided in 2 parts one can say. One is the the ruthless media man who does anything to get what he wants while the other is the caring person who wants those around him to bloom while he watches from distance. As the other two characters this one is unique in the sence that he portrais different sides of a male main character in an anime whom you never really know if is going to someone you dislike or someone you want to follow as much as the other mains. These 3 characters are at the center of this great anime and one feels it as the story and other characters are supporting them in every sense. I never expected to find this anime and when i found it i was surprised and over the moon. Rarely do i get to find these hidden gems and always after finishing one of those i am afraid that this will be the final one. That is why i enjoyed this in every way i could. I loved the story and how it was set and that it created a perfect atmosphere that captured what i romanticize as acting in its purest form. Which is also why i have basically nothing bad to say about it. Overall i rate this anime as a masterpiece since as of now there are few anime that deals with acting in the way this anime has captured in and i dont think that as of now there are many if any anime that can compete with this anime with this concept. This anime is a masterpiece for everything it does. It doesn't try to make something out of nothing and it doesn't try to drag things out in ways it shouldn't be. Its one of those anime you will hope in your heart that you wont forget because of how great it is.